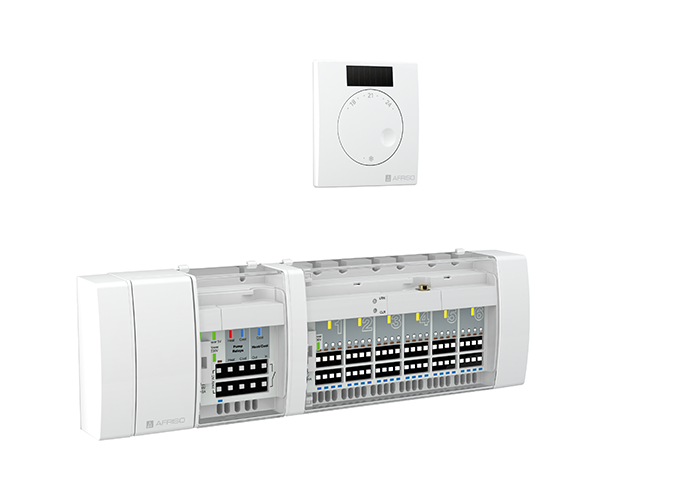 Controls the temperature of individual rooms in connection with manifold systems for heating or cooling. 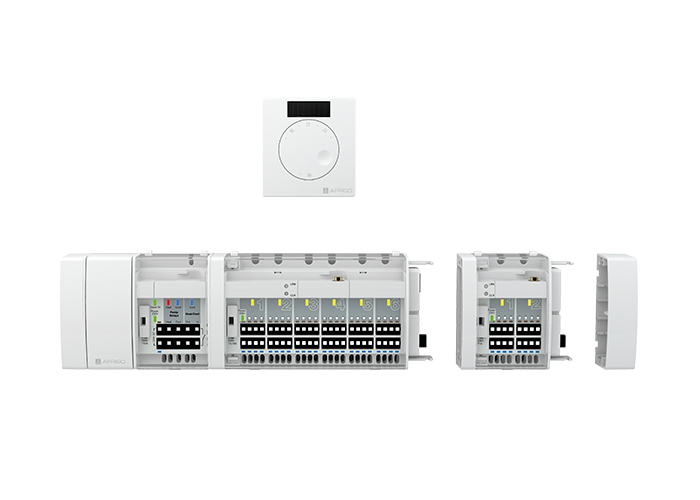 EnOcean® wireless technology for integration into building automation systems. The base version of the single room temperature controller CosiTherm® Wireless consists of a base module, at least one controller module with two or six independent control circuits and a corresponding number of room temperature sensors. 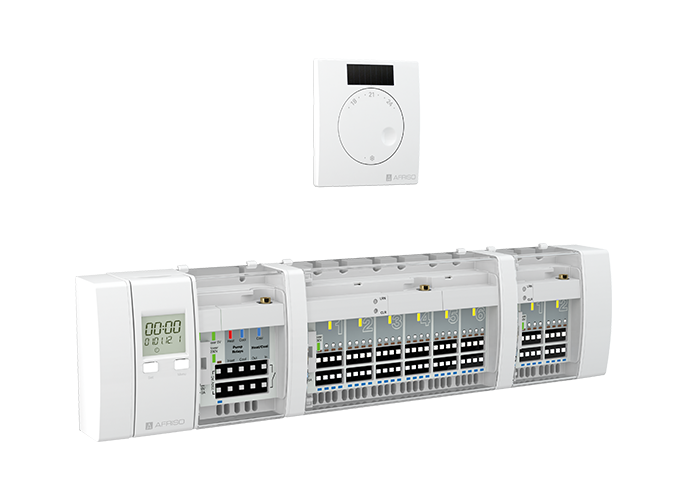 The controller modules can be interconnected in a modular way to account for the number of control circuits/rooms. One room temperature sensor is required per control circuit; the standard version is battery-less and connected to the controller module via the EnOcean® wireless technology. The room temperature sensor measures the actual temperature in the room. The reference temperature is adjusted via the rotary knob of the room temperature sensor or via the app AFRISOhome. The controller module compares the actual temperature and the reference temperature and controls the volume flow of the heating/cooling water via the thermal actuators of the manifold system. 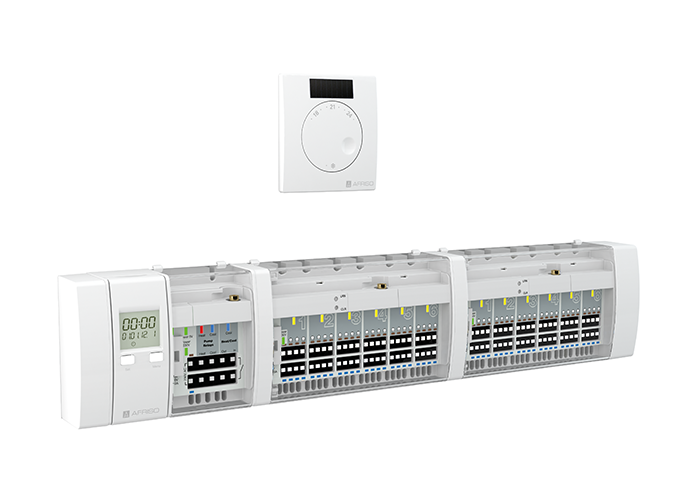 An optional timer module with display and an integrated hundred-year calendar can be plugged into the base module. It features two independently programmable switching channels for temperature reduction, nine programmable memory blocks and a valve and pump protection function. The additional pump running time is adjustable. The terminals of the controller modules are colour-coded for easy assignment to the wires of the thermal actuators; in conjunction with the DIN rail snap connectors at the rear of the housing, this facilitates installation. With an AFRISOhome gateway, it is possible to remotely check and, if necessary, adjust the room temperatures via the AFRISOhome app (for example, when coming back from winter vacation). This flexible remote control of the room temperature combines multiple benefits: you can increase living comfort and reduce energy costs.In conjunction with additional AFRISO products with EnOcean® wireless technology, the user can configure a whole range of fully customisable, extensible applications.